Hi Ken… Looks like your message got truncated somehow when it was posted… Not sure what the rest of your thought was. Having one doctor is a good idea, but then you have only one set of eyes looking at the puzzle. I have one doctor and it’s gotten so that I kinda know what he’s going to say. I don’t know if that’s good or bad? Hi Eric. No I agree that there’s value in having other opinions. I guess I just get a little frustrated having to go through my entire history with each of them, and then try to assess where their heads are at during a relatively short consult. Sounds as if you are inadvertently getting a second opinion! You could then get a third and fourth opinion in the next two quarters. Add to that a fifth opinion from Dr Google. However I, like you, would prefer to build up a relationship. Interestingly I have had one oncology consultant but a variety of haematology consultants – whoever picks up the file first – but it seems the team discuss all the cases before the clinic. I have built up rather wider knowledge because of this I think. Thanks, Tim. Yes, I agree and actually do value getting diverse opinions on my case—it’s been happening for several years now. Like you, each has given me something new to think about, so it’s not necessarily a bad thing. Thanks, Andrew. I’ll take it! I am so with you on this. He basically tells you he doesn’t know what’s going on or how to get closure except wait. Then he pronounces the cancer won’t kill you. How does he do that?! You are smart to be skeptical. The only prediction my oncologist will make is that I am going to die from something at some point in time. On balance I do think it’s good news. I appreciate that you want closure, but it’s worth waiting years to finally get closure if the answer is that it’s gone. I’m so glad to hear he doesn’t want to start ADT or do radiation. Enjoy this time as best you can! Hi Jim. Yeah, it was a tad frustrating, but I get that he has to cover all of his bases. I agree that it is good news, all things considered. There was just something about him and the whole interaction that overshadowed that when I wrote my post yesterday. Doing better today. That makes sense, sometimes you just get an uneasy feeling. In my case more often than not it was right! Ok, this is nuts. I posted and then I checked the post, and the entire post was showing, untruncated. Then I left , came back now, 15 minutes later, and it’s half gone again. Is there a character limit? Hi Ken. Yeah, I saw that. No character limit as far as I know. On top of prostate stuff, I also have glaucoma. I had the same ophthalmologist for 18 months, then suddenly a new guy whose observations, opinions and depth of technical details completely differ from the first one. I find this unsettling and it throws in doubts about competence of those on whose pronouncements I have relied. 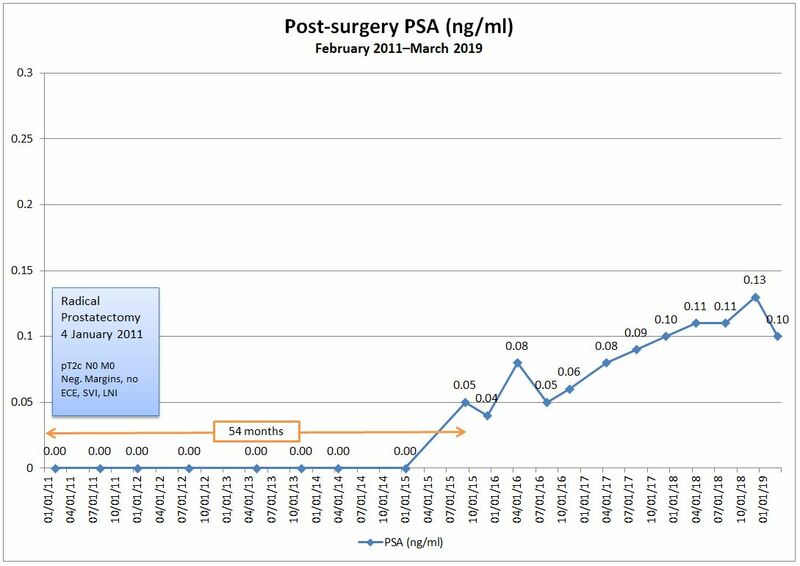 As to the prostatectomy, 19 months on, I am now on four-monthly PSA checks instead of three-monthly, so I feel moderately secure about prognosis. The surgeon will see me only annually, but gave me his phone number following discharge from hospital in case I wish to ask/report anything. Even though I haven’t used it since removal of the catheter, I have felt strangely comforted simply by having it on my phone. These are important aspects, not often acknowledged.